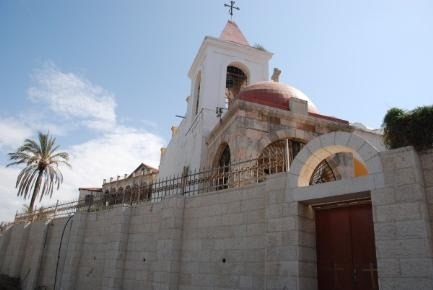 Coptic Christians arrived in Jaffa following the invasion of Ibrahim Faha (1831-1840) and established the church in 1855. Back when Coptic pilgrims to Jerusalem came by ship from Alexandria to the Jaffa Port, the Coptic Archbishop at the time built a large complex (similar to a grand hostel) to cater for them. They used to spend the first night of their Pilgrimage their, and then travel on foot to the Holy City of Jerusalem. This grand complex remains to this day, but is now in the grounds of a Coptic Monastery, which also includes a Church, and a burial site for Bishops. The Jaffa Port (known Biblically as Joppa) is the same port from which Jonah the Prophet embarked on his trip, escaping God's will. It is also the site off the House of Simon the Tanner (Acts 9,10), where St Peter resided and dreamt regarding the inclusion of Gentiles into the Church.